I’m raising funds for legal representation at the final public hearing of the North Yorkshire Minerals Plan in order to defend hard-won protections for communities facing the threat of fracking. It’s crunch time for the North Yorkshire Minerals and Waste Joint Plan (for brevity's sake, let’s just call it ‘The Plan’). This rather dull-sounding but very important document establishes planning guidance for all types of minerals and waste development – including fracking – across North Yorkshire until 2030. The Plan has already been agreed by the North Yorkshire County Council, the City of York Council and the North York Moors National Park Authority following a five-year process of consultations, reports, drafts, meetings and public hearings, and was provisionally approved by a government appointed Planning Inspector at a special meeting called an Examination in Public (or EIP) on April 23rd 2018. If The Plan has already been approved, what are you fundraising for? The Plan has only been provisionally approved, but has not yet been finalised. Since the EIP in April last year, there has been intense pressure from the oil and gas industry to dilute or remove the safeguards on fracking included in the Plan (more in this below). There is now going to be an additional public hearing on the Unconventional Oil and Gas section of The Plan on Thursday 24th and Friday 25th January. You can be sure that the fracking industry will have their highly-paid corporate lawyers in the room pulling out all the stops to persuade the planning inspector to remove the safeguards on fracking contained in The Plan. 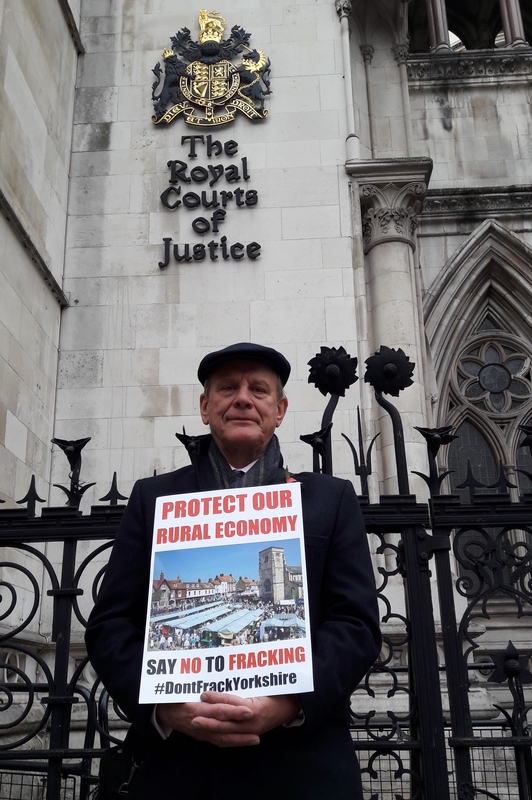 It’s therefore vital that local communities opposing fracking also have professional legal representation at the public hearing to argue their case – which is what this appeal is seeking to fund. What are the fracking industry complaining about? The provisionally approved version of The Plan has a separate section on fracking, which is an attempt to find a compromise between the interests of the oil and gas industry and the concerns of local residents, businesses, parish councils, farmers, landowners and North Yorkshire’s vibrant tourism industry. The Plan now contains some clauses that establish modest safeguards on the fracking industry intended to prevent the industrialisation of the countryside in one of the most popular tourist destinations in the UK. One such clause prevents fracking from taking place less than 500m from people’s homes or other occupied properties, unless there are exceptional circumstances. 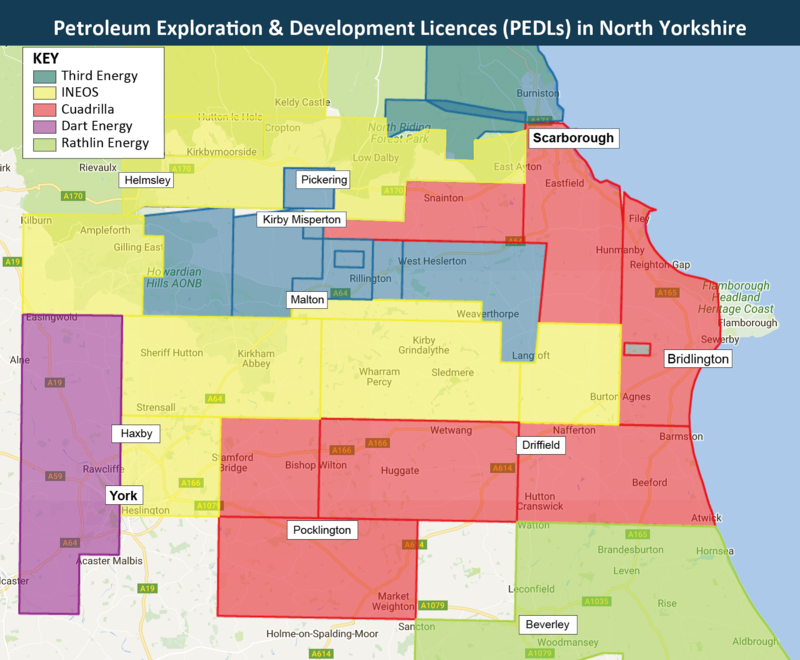 The industry are very unhappy about this as they envisage grids of drill pads across North Yorkshire, each pad comprising 2 hectares in size and 10 such pads in every 100 km2 (38-square-mile) Petroleum Exploration and Development Licence (or PEDL, as they’re known). This translates as one well pad (with multiple wells on each pad) every one and a half to two miles in every direction. As you’ll see from the map below, this type of development would impact the whole of North Yorkshire, which is almost totally covered in PEDLs. What else is the fracking industry upset about? Another key issue is that The Plan defines any drilling operation intended to produce hydrocarbons from shale rock as ‘fracking’, while the industry argue that it should only be classed as fracking if more than 1,000 m3 of fluid (or 10,000 m3 in total) is used - which is how the government arbitrarily defined fracking in the Infrastructure Act 2015. The definition of fracking included in the Plan is very important, as if the Infrastructure Act definition were adopted it would allow companies to establish large numbers of well sites across North Yorkshire, and provided they kept the amount of water used just below the IA limits, they would be able to claim that they weren’t fracking. This loophole also means that companies may be able to frack for gas in protected areas such as National Parks and AONBs – where fracking is currently prohibited. On April 13th a government-appointed Planning Inspector gave her provisional backing to The Plan, including the 500m buffer zone and the councils’ definition of fracking. This enraged the oil and gas industry, who claimed that a 500m buffer zone would ‘sterilise the exploitation of shale gas’ and announced that they would be taking immediate steps to get the inspector's findings quashed. Only five weeks later, Greg Clark issued a Written Ministerial Statement (WMS) outlining the government’s agenda for fracking in England. One section of the WMS appears to be specifically dedicated to overturning The North Yorkshire Plan, saying ‘Plans should not set restrictions or thresholds across the plan area that limit shale gas development without proper justification’ and that planning authorities should also recognise the government’s definition of fracking as stated in the Infrastructure Act. The Statement also said that ‘policies should avoid undue sterilisation of mineral resources (including shale gas).’ Coincidence? We don’t think so. We believe the Written Ministerial Statement was a desperate attempt by the oil and gas industry and central government to override the safeguards on fracking included in The North Yorkshire Plan, and is likely to have been the result of frantic lobbying by the oil and gas industry in the days after The Plan was provisionally approved. It appears that the carefully considered decisions by democratically elected councillors, who have spent years drawing up The Plan in consultation with local communities and businesses, count for nothing in the face of the demands of the increasingly desperate and unpopular fracking industry – an industry which has recently caused over 50 earth tremors at Cuadrilla’s fracking site in Lancashire, and has been effectively banned from operating at all by the Greater Manchester local authorities. How does this relate to the Judicial Review application that you brought in November? The application for a Judicial Review (which was successfully funded by generous supporters via this Crowdjustice page) challenged the legality of the Written Ministerial Statement (WMS), and is directly related to The Plan. 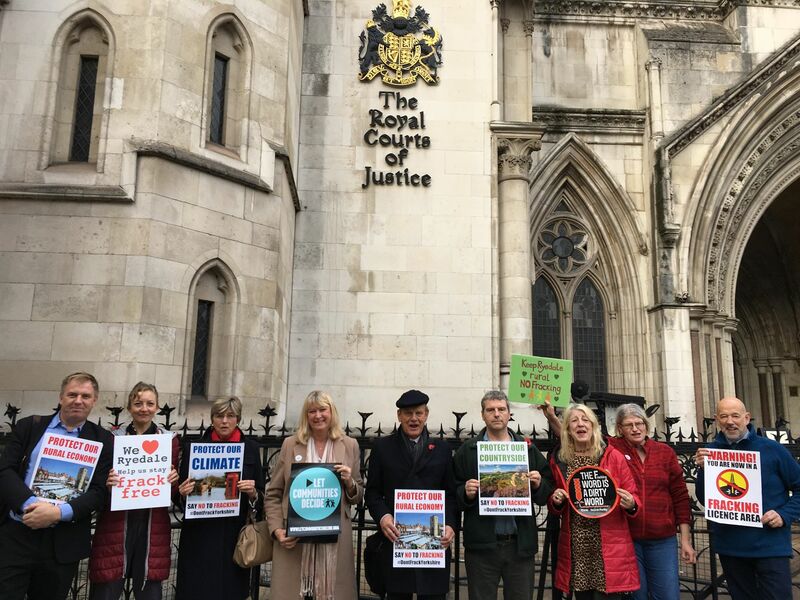 While we did not win permission for a Judicial Review, we did manage to achieve some significant concessions from the government, who stated in their pre-hearing submission that the requirement to "recognise" the Infrastructure Act definition of fracking did not require planning authorities to "apply" it, provided that they had sound reasons not to do so. The government also conceded that the MWS was simply re-stated previous policy and should not be seen as a new policy statement. One of the key tasks of the barrister we are seeking to hire in order to represent local communities at the forthcoming EIP is to put forward the arguments that resulted from the government’s submissions for the JR hearing and the Judge’s legal opinion. We believe these should allow the planning inspector to pass The Plan in its current form with the safeguards in place. The fracking industry’s lawyers would disagree with this, of course – which is why local communities need a lawyer in the room when this is being discussed. I’m not from North Yorkshire. Why should I care about this? Every local authority in the country has to produce a version of The Plan that takes into account how they deal with the fracking industry, and many are looking to the North Yorkshire Plan as a template to follow when it is their time to revise their current plans. So, whatever happens with the North Yorkshire Plan is likely to influence local plans up and down the country, which is why it’s so important to retain the limits included in the provisionally approved version of The Plan. Also, last year’s report by the Intergovernmental Panel on Climate Change (IPCC) issued the starkest warning yet that we need to drastically reduce our use of fossil fuels by 2030 or face catastrophic climate change. In the wake of this devastating report, councils up and down the country - including Greater Manchester and the Conservative-led council in Scarborough - have passed motions declaring a climate emergency and committing to become carbon neutral by 2030. In this context it’s clearly a disastrous policy move for the government to be championing a brand new fossil fuel industry when it’s clear that the country needs to be moving rapidly towards a low-carbon economy based on clean renewable energy. If you care about protecting local democracy, are concerned about climate change and want to prevent the industrialisation of the English countryside as envisaged by the fracking industry, please support my appeal by making a donation at the top of the page. Thank you very much for taking the time to read about this case and for helping to protect our countryside, our climate and our local democracy. Please also consider passing this appeal on to your friends and family, and sharing it on your social media. Paul Andrews is Mayor of Malton Town Council, a Ryedale District Councillor and Chair of Habdon Parish Council, and has been authorised to speak at the Examination in Public on behalf of these three elected bodies. The legal representation Mr Andrews is seeking will be entirely funded by this appeal and other private donations, not by the aforementioned councils. I used to live in N Yorks, and my stepdaughter still does. Fracking would ruin the place. It's only a stopgap anyway - the life of a fracked well is very short. I'm totally against it.